I’d heard so much about Margaret River Gourmet Escape (MRGE) and it had been on my bucket list for a while, so imagine how excited I was to be there for the event from November 16-18, 2018. Margaret River is a three-hour drive from Perth and this was the 7th edition of MRGE. Double the excitement when I found out who was going to be there too. Nigella Lawson, British cookbook author and host of Nigella Kitchen, Tetsuya Wakuda of Tetsuya’s (Sydney) and Waku Ghin (Singapore), one of my favourite Japanese chefs, Jake Kellie the Master of Smoke & Fire at Burnt Ends (Singapore) and celebrity chefs from UK, USA, Singapore, Mexico, France and Denmark. 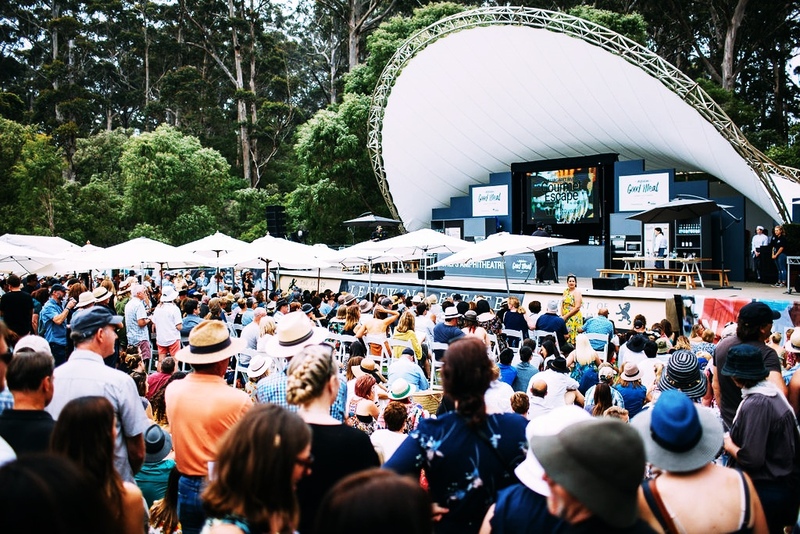 This year, there were over 45 events happening in 25 locations in Margaret River, including the iconic Gourmet Beach BBQ and Leeuwin Estate Gourmet Village to Feast In The Forest, Sunset, Beats & Bites, Fraser Gallop Estate Long Lunch and Dining By Twilight at Margaret River’s Secret Garden. I couldn’t wait to be up close and personal with the chefs who also included Rick Stein (UK), Mitch Orr (Acme, Sydney) and Matt Stone (Oakridge Wines, Australia), Skye Gyngell (Spring, UK), Monica Galetti (Mere, UK), Niki Nakayama (n/naka, USA), Andrew Wong (UK), Alex Atala (D.O.M., Brazil), Edgar Núñez (SUD 777, Mexico), Rosio Sánchez (Hija de Sanchez, Denmark) and James Lowe (Lyle’s, UK). On the eve of MRGE, chefs came together for a private Gourmet Beach Barbecue at Castle Rock Beach. 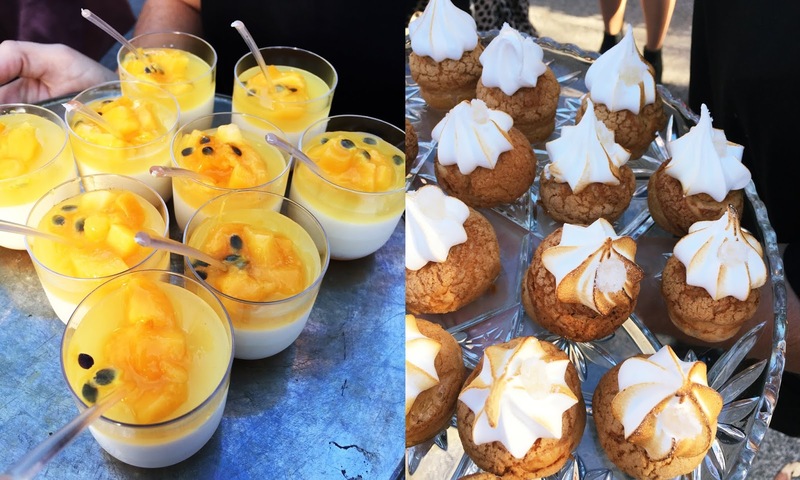 This by-invitation-only event gave chefs the opportunity to mingle and renew friendships. Tents were set up with tables and chairs inside, stoves fired up and, at one end of the beach, entertainment to give the party a boost. Canapes were served, along with free flow of bubbly, wines, beer and soft drinks. The weather was fine but the brisk wind proved a tad chilly, so most of us huddled around tables set up under the tents for protection. The beach barbecue amplified the Aussie love for barbies. But here, we let the chefs work while everyone else sat back and had a good time. The menu included wagyu beef sliders, kingfish poke on cassava cracker, Linley Valley pork sausages, chicken skewers, herbed dorper lamb cutlets and for dessert, we had Nigella Lawson’s Emergency Brownies and ginger wine syllabub. The Beach Barbecue (A$230) was also held on Friday, Saturday and Sunday for members of the public, with different menus. On Saturday, we were treated to more dorper lamb cutlets, chicken skewers, fish skewers, grilled asparagus, grilled corn and pan-roasted potato. It is said that one cannot claim to have participated in the MRGE if one has not dipped one’s toes in sand while holding a bubbly in one hand and a barbecued sausage in the other. So I’m delighted to have just gone beyond the record by attending two in one weekend. On Friday, we had a chance to talk to some of our favourite chefs. While Nigella was fully occupied with video interviews, we hopped around for short one-on-one chit-chats with the other chefs. It felt somewhat like “speed-dating” (hahahaha!) but with the chefs. I managed to exchange a “hello” with Tetsuya Wakuda before I spied Jake Kellie in a corner table, looking cool in a black Burnt Ends T-shirt, with tattoos on one arm. On Saturday, we headed for The Gourmet Village (A$40 for advanced online tickets; A$50 at the door; free for kids under 16), held on the manicured grounds of Leeuwin Estate Winery, an event packed with wine tastings, cooking demonstrations, panel discussions, masterclasses and product showcases. Also held on Sunday, the event from 11am to 6pm allowed participants and visiting chefs came together to find out more about local produce and to sample signature dishes and wines by artisan producers from WA. Many people got comfortable on picnic mats laid down in the shade of old trees and getting bites of food offered by restaurants such as Rustico @ Hay Shed Hill, Bao Wow, Xanadu, Caves Road Collective, Ma La Dumplings, Brika, Amelia Park, The Gourmet Fried Chicken Bar and Lavash by Sam’s Foodie Goods. There was just no way to resist the smells wafting over. In between bites, one could listen to chefs talk at the Chefs Amphitheatre and The Butcher’s Block, get a book signed, sample wines or beer, talk to wine makers, get tips at cooking demonstrations or have a tete-a-tete with food influencers at Consuming Conversations. Families with children signed them up for The Little Garden Kitchen, an event that introduced them to the joys of growing and cooking their own food. I trotted off to the Regional Flavours tent to watch chef Aaron Carr of Yarri Restaurant prepare a dish of Prawns With XO and Saltbush. We were lucky to get tickets (courtesy of Tourism Western Australia) to The Westpac Leeuwin Estate Platinum Lounge. For A$255 (advance booking), visitors get fast-track entry, a wine-tasting glass, two glasses of Leeuwin Estate wine and sample a variety of cheeses (accompanied by crackers, cranberry jelly and sundried raisins) while Leeuwin Estate’s Dan Gedge and the kitchen team made sure the canapes and hot food did not stop coming out. At the verandah, we also had apanoramic view of the happenings on the lawn. On Sunday, the highlight was Nigella’s Tea Party at Howard Park (A$225) at 3pm. With the beautifully clipped lawn and flowers everywhere, it looked almost like an English garden tea party. We sipped flutes of Howard Park’s new release, Petit Jete sparkling wine, whites, reds, rose and even hot tea from Herbal Eemporium while nibbling on savoury and sweet treats made by celebrated West Australian patissiere Rochelle Adonis. There were cucumber ribbon sandwiches with dill aioli, slow-roasted tomato tarts, cones filled with lemon cream, cured salmon and tapioca pearls and crisp potato rings filled with mushroom and topped with a quail egg. We ended with raspberry meringues filled with mascarpone and strawberries, torched lime-vanilla choux and luscious violet-milk chocolate tarts. The MRGE highlights the food and wines that the South West region of Australia is famed for and puts WA on the world tourism map. Margaret River, among the world’s top wine producing regions, is home to 217 vineyards and 187 wineries. The annual event attracts foodies and industry folks from not only Western Australia (WA) but also the rest of the country and globally including. With the more than positive response, the organisers are now looking to expand the event next year with a 10-day programme and two additional locations: Swan River and Perth.